Micro 27mhz AM 2 Channel Receiver. This micro receiver will take up less space than your current one making your car lighter and faster. It is also easier to fit a fail safe with this receiver. Note: Crystals and other parts not pictured not included. I now use 2.4ghz so have no use for it. As you can see from the pictures this is a boxed system including the transmitter, receiver and receiver battery holder. This is an ideal set for a period kit or for a beginner just starting out in the hobby and not wanting to spend loads on a 2.4ghz setup. The sticks feel good, the arial is in excellent condition, there is a rubber bung missing from the Xtal cover. The plugs are in very good condition. The deacs needs replacing. Both ch argue leads are there, even a couple of servo trays. Xmods Xmt007 Crystals set 6 Pair Tx & Rx Super Street Mirage. PART NUMBER XMT007. 6 MATCHING PAIRS RX & TX. 1 PAIR OF EACH BAND 7-12. 5 out of 5 stars - Xmods Xmt007 Crystals set 6 Pair Tx & Rx Super Street Mirage. 2 product ratings2 product ratings - Xmods Xmt007 Crystals set 6 Pair Tx & Rx Super Street Mirage. 27mhz AM 27.145 Crystal Tx & Rx (1 pair). Suitable to fit 27mhz AM frequency radios. Channel 8 Yellow Tab. RC FUTABA 2 Channel 27 MHz BEC AM FP-R102JE Radio Control Receiver for Tamiya. Condition is Used. Dispatched with Royal Mail 2nd Class. Futaba Attack-R Radio Gear. Condition is Used. Dispatched with Royal Mail 1st Class. 27mhz AM 27.075 Crystal Tx & Rx (1 pair). Suitable to fit most RC kits including Futaba and their copies. 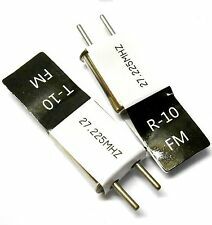 To suit 27 MHZ AM Frequency Radio Kits. AM Crystal 26.995 (1 pair). 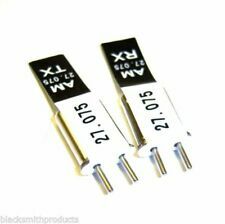 AM Crystal 27.045 (1 pair)-Note: running low 27.125 being supplied instead. AM Crystal 27.095 (1 pair). AM Crystal 27.145 (1 pair). As you can see from the pictures this is a boxed transmitter. I now use 2.4ghz so have no use for it. 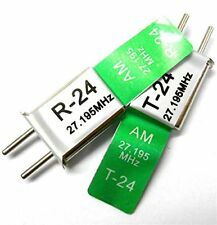 To suit 27 MHZ Frequency Radio Kits. FM Crystal 26.995 (1 pair). This works with 27mhz FM kits only. Checked to work on 27mhz FM 2 Channel Radios. 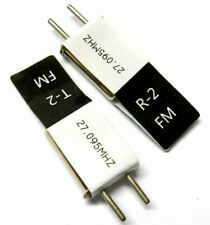 To suit 27 MHZ Frequency Radio Kits. This works with 27mhz FM kits only. FM Crystal 27.225 (1 pair) CH 10. Acoms AP-202 is paired to the AR-2 Receiver. The crystal is Rx band 3. ACOMS Transmitter Controller acoms AP 227. Condition is Used. Dispatched with Royal Mail 1st Class. Working controller in box no accessories included. Just the controller. Couple of scratches on case. All taken out of various models over the years as all moved to 2.4. Acoms Techniplus 27mhz radio control transmitter. Condition is Used, but in excellent condition Dispatched with Royal Mail 1st Class. Futaba 2ch RC transmitter and Receiver 27MHz T2PHKA. Condition is Used. Tested and working. Has end point adjustments, channel 1 crystals, I in good condition. Dispatched with Royal Mail 2nd Class. I now use 2.4ghz so have no use for it. As you can see from the pictures this is a transmitter only. You will need to source a receiver. 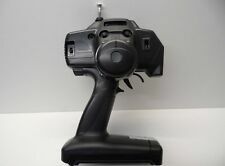 Up for sale is a boxed Futaba Attack-R FP-T2NBR transmitter! 2 Channel 27MHz, AM This item has been tested and is fully working! Excellent, lightly used condition. It has only been used a handful of times. (Please see photos) Battery terminals are clean. Arial pole is straight. The cardboard box is beginning to deteriorate. Suitable for use with many radio controlled brands, like Tamiya/ Acoms/ Hitec/ Sanwa etc... Sold as seen. Any questions please ask. Postage to the UK is free. I also post overseas. Check out my other items for more vintage and modern radio controlled parts! Thanks for looking. HPI TF-1 Transmitter/ Controller. 27MHZ, AM, 3 Channel. Suits Tamiya/ Acoms Etc. Condition is Used. Here we have an old 27Mhz BEC receiver (FP-R102JE) and two servos (FP-S148) ideal for an old Tamiya, Kyosho or similar RC car or model boat. Also includes an on off switch. As you can see from the pictures this is a transmitter only. You will need to source a receiver. 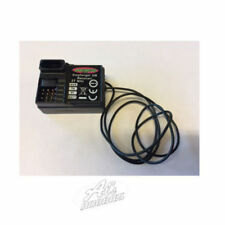 As you can see from the pictures this is an un-boxed transmitter & receiver set. I now use 2.4ghz so have no use for them. 27mhz AM 27.195 Crystal Tx & Rx (1 pair). Suitable to fit most RC kits including Futaba and their copies. Suitable to fit 27mhz AM frequency radios. Old used item ,,but working no batteries and no crystal . Used item ,but working no batteries. 1 x FM 27MHZ 4Channel Receiver. - Frequency: 27MHZ FM. Suitable for FUTABA KYOSHO TAMIYA AM Radios. Brazil,Spain, Italy, Moldova, Russia, Romania, Greece, Hungary, Czech Republic, Turkey. About 3 - 5 Weeks. 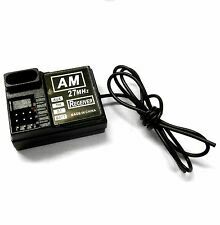 27Mhz AM 2-CH so will work with any other mainstream 27Mhz 2-channel AM R/C (e.g. Futaba, Acoms, Sanwa, Hitec etc) if you use a matching set of crystals. Tested and working. Transmitter only (no receiver / crystals / batteries included). This AM transmitter has only been partially tested, I have put batteries in and it powers up fine, however I don't have a receiver or servos to test it fully, but I don't see any reason for it to not work. Vintage Futaba R152JE Receiver! (2 Channel, 27MHz AM). Suits Tamiya, Acoms Etc. (2 Channel, 27MHz AM). Suits Tamiya, Acoms Etc. 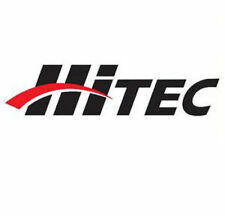 Vintage Hitec 2 Channel Receiver! HP-2RNB. BEC 27MHz, Suits Tamiya/ Acoms Etc..
BEC 27MHz, Suits Tamiya/ Acoms Etc.